Nigeria’s Super Eagles will battle for one of Africa’s five slots for the 2018 World Cup finals from a tight corner. The senior national team has been handed tough opponents in the African qualifying zone draw for the 2018 World Cup finals in Russia. Nigeria is placed in Group B alongside Algeria, Cameroon and Zambia where only the top team will qualify for the World Cup finals. Cameroon, Nigeria and Algeria were three of the finalists in 2010 and 2014, they all look back at 16 appearances on the greatest soccer stage. For the Super Eagles, who have already been knocked out of the AFCON, the draw must come as a bitter disappointment as Nigerians were looking toward the World Cup to restore the country’s pride as a great soccer nation. However, for a team that has become famous for dramatic qualifications, the Super Eagles can never be written off to stoke their chances against the powerful Foxes of Algeria, the talented Lions of Cameroon and 2012 African champions – Zambia, who have also been eliminated from qualifying for next year’s AFCON in Gabon. There is no doubt that from the start to the finish, the qualifiers are as competitive and tricky as any other in a group of death. Except Zambia, any of other teams is a potential group winner in Group B. And the Eagles have to be on top of their games to conquer the group. Nigeria qualified for the 2014 World Cup finals in Brazil literally on a platter of gold, albeit beating lesser ranked countries such as Kenya, Namibia and Malawi before confronting the lowest-ranked side of all the group winners, Ethiopia, in the playoff round. 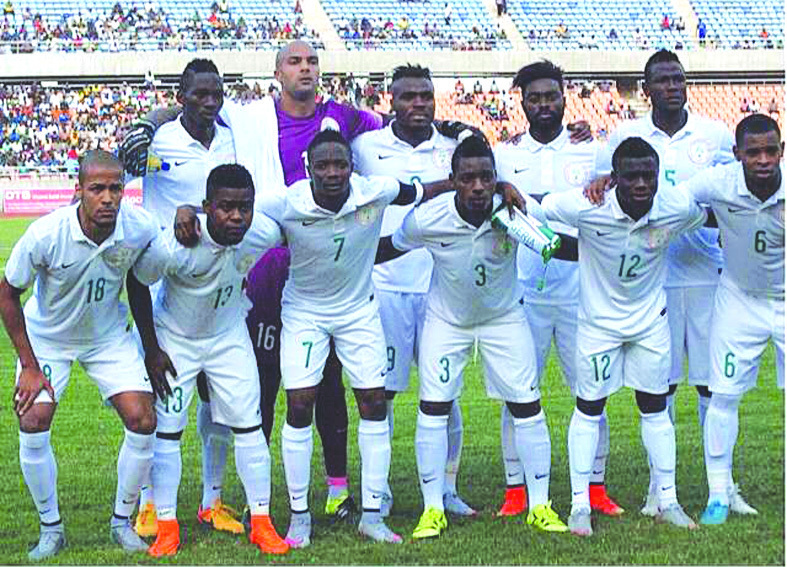 The then Stephen Keshi-led Eagles secured the prized ticket to Brazil after walloping Ethiopia 4-1 on aggregate, with routine home and away wins. While the Nigerian senior national team remains a team to beat on the continent and at the global stage, battling two of the top 10 teams in Africa for a spot in the 2018 World Cup finals may prove a daunting task. 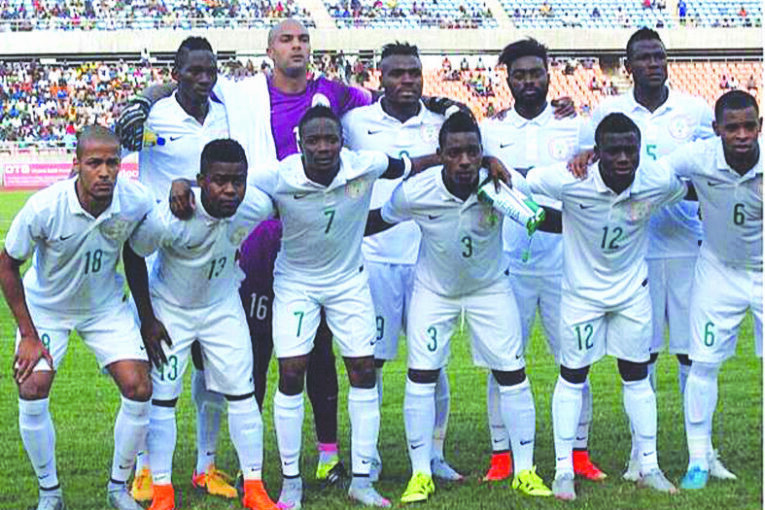 Analysts point at Nigeria’s poor execution of qualifying matches as its greatest Achilles heels and the major reason it often crashes out of continental or global football championships. Frank Ekwonwa, a football analyst views logistics as major set-back for the country. “Nigeria’s qualification for major football championships is always hamstrung by poor planning and execution of the qualifiers. Excluding the technical blunders that most coaches saddled with the qualifiers commit, Nigeria could easily sail through any World Cup or AFCON qualification groups,” he said. Also considered a major challenge is political squabbles in the Nigeria Football Federation (NFF) which often affect the logistics and technical support of the national team. The Minister of Youth and Sports, Solomon Dalung hinted on this issue when he blamed the recent NFF leadership crisis and resignation of the late Stephen Keshi for the failure of the Super Eagles to qualify for the 2017 AFCON.“It is sad that we are not attending the Nations Cup back to back and I guess it is because that we are not playing the politics of football well,” Dalung said. He regretted that “hiring and firing of coaches” is still a major problem for the country. The minister claimed that the NFF and the Ministry of Youth and Sports had no explanation and justification for not qualifying for the AFCON 2017 because everything needed was provided. Former Super Eagles goalkeeper, Peterside Idah agreed, but picked holes on the inability of the football body to pay the technical team. “They (NFF) cost us this Nations Cup. Just pay your workers and we won’t have these problems,” Idah wrote on his Facebook wall. Incidentally, shortly after the Super Eagles’ AFCON ouster, NFF announced that it had commenced preparations for the country’s 2018 World Cup qualifiers. “We can disclose that the NFF has now fully shifted its focus to activating its already prepared plan to give the team all the support it needs to qualify for the 2018 FIFA World Cup, while continuing to build a sustainable football culture for Nigeria in order to make Nigerian football once more a force to be reckoned with”, NFF statement released on March 31 read. As part of that plan, the Super Eagles played and won two friendly matches 1- 0 against Mali and 3-1 against Luxembourg during the FIFA free windows last May. Although, the victories were largely hailed as positive development, the fact that the team was managed by stand-in coach Salisu Yusuf with the NFF still shopping for a new coach is an indication that the country’s World Cup plan is still far-fetched. NFF had in April disclosed that it would name a permanent coach for the Super Eagles in June, ahead of the final round of qualifiers for the 2018 FIFA World Cup. There is no indication that appointment of a new coach will be actualized in June.